At least two passengers aboard a pair of delayed Air Transat flights at Ottawa International Airport called 911 on Monday. According to CBC News, two Montreal-bound flights from Europe experienced significant tarmac delays after being diverted to Ottawa because of thunderstorms. Some hot and hungry passengers took to social media to express their frustration, while one spoke to CBC News from inside the cabin. "The plane actually lost power and went zero AC [air conditioning], and then now we've got the doors open and one kid is puking, and people are just losing their minds," passenger Laura Mah told the publication during the delay, pointing out that paramedics arrived after someone phoned 911. "They're just getting mad, saying 'This is not all right, this is not OK, you can't do this to us.' The police are in here and the fire department's in here and they're telling us that they can't do anything, that we just have to stay put." Mah's flight from Brussels eventually arrived in Montreal at 11:30 p.m. ET Monday, more than eight hours behind schedule. Another Air Transat flight from Rome was delayed four hours in Ottawa. That flight finally took off for Montreal roughly 30 minutes after one of the passenger's dialed 911 to ask for help. Ottawa International Airport Authority spokeswoman Krista Kealey told CBC News dozens of flights were diverted to Ottawa Monday due to the stormy weather and noted that it's up to the airlines to decide whether passengers should deplane. I'm sorry to hear that - it's up to the airline to determine whether to deplane or wait it out when a flight diverts. "We did have buses on standby in case they decided to disembark their passengers and process them through customs," said Kealey. "However, that decision was not taken by the airline, and ultimately it is the airline that is responsible for making those decisions about whether a flight disembarks—and, in the case of an international flight, processes through Canada customs—or whether it sits and waits it out in the hopes that it can get to its final destination." According to Kealy, the flight from Brussels was delayed all afternoon and evening because of medical calls, mechanical issues and refueling. 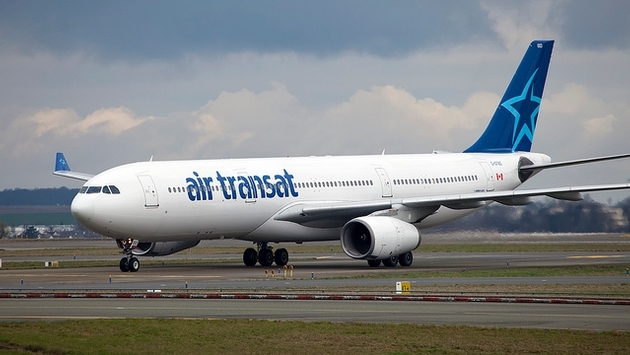 While Air Transat did apologize for the inconvenience, it shifted some of the blame to the airport, claiming that staff wasn't able to provide bridges or stairways to allow passengers to disembark their flights as a result of the influx of traffic. "We are sincerely sorry for the inconvenience that this situation, which was beyond our control, may have caused our passengers," the airline said in an emailed statement.